Time for the next installment in Top Ten Things Writers Need to Remember About the Martian Manhunter...the first one is here. 9. J'onn is a detective. Most importantly, even though he was marooned here against his will, J'onn choose to be a detective to help rid Earth of crime so that we could enjoy an enlightened age just as Mars has. 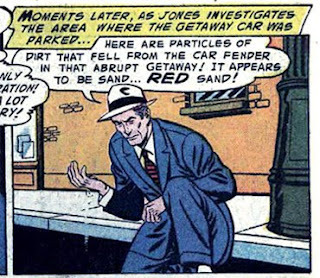 Back home on the Red Planet, J'onn was a scientist. He believed, much like we do, that science--reason, enlightenment, technology--will bring us a better future, free of human hardship. If you know anything about science in the 1950's, this will make a lot of sense to you. J'onn choosing to help us out is all rather benevolent and what we would expect from an advanced race. Now. Let's clear up this whole "Manhunter" business, becuase I think it needs to be addressed. In recent years, his role back home has suffered from the same muddled treatment that pretty much everything about his character has suffered. So what's a "manhunter?" In his 90's solo series, J'onn was said to have been a "manhunter" back on Mars, and it's defined as sort of a policeman who hunts down people. (Like a Mountie, I guess?) So, basically, when he arrived on Earth, he's doing pretty much the same thing he was back home. Where does that leave his decision to help us out and bring forth a better future for us? I guess in limbo. So why'd his original creators use the word "manhunter?" What does it mean? It's dumfoundingly simple, really. Back in the day, a manhunter was just another word for someone out looking for a criminal. You know, like a cop. 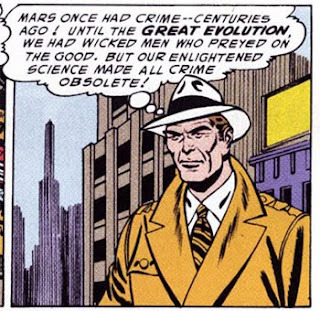 So, in his early days, when J'onn was known as "The Manhunter from Mars," basically it means, "The Cop From Mars." Occasionally you'll hear "manhunt" today when police are out looking for a criminal at large: "the manhunt for so-and-so continues," etc. The Spanish-language version of "The Martian Manhunter" provides a more apt title: Detective Marciano--Martian Detective. It's a much more accurate description, and if I had to change one thing about J'onn J'onnz it would be that. So there you have it: J'onn J'onnz is a detective who happens to be a Martian. This is another area I plan to drone on about in the future, though my conclusions are somewhat more complicated. "Benevolent alien" was where I used to sit on the issue, but with thought I've come to see some serious gray here, especially in light of Bronze Age revelations. "This is another area I plan to drone on about in the future." Go for it! "especially in light of Bronze Age revelations." See, this is why my perspective is skewed: I've read very little Bronze Age Martian Manhunter appearances. Maybe that's a good thing, maybe that's a bad thing, I don't know. It's a good thing, believe you me. It's continuity, so I'm stuck acknowledging it, but it ain't good readin'. Aside from the fantastic JLofA #144, you'd be well advised to avoid anything until the early 80s.